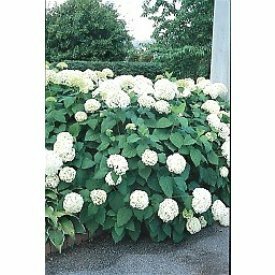 Annabelle is a stunning white hydrangea, Height and spread 3 to 4 feet. Huge, 10 inch snowball white flowers, June-August. Blooms develop on current year's growth. A very showy plant. Especially good in a shady corner of your garden or yard, as the pure white flowers stand out among the dark green of the foliage. Standard Notice: Please allow 2-3 days for your order to be processed. Keep in mind that many of our plants and trees are shipped in a dormant condition. Soak overnight before planting. In general, these items can be planted anytime your ground is not frozen. An early snow or frost will not harm a nursery stock item that is already dormant. On the other hand, these items can also be planted during warm weather--simply be sure to water well. Ship Restrictions, We don't ship on Fridays due to the waiting on the weekends we ensure that plants will arrive in the same condition we send them in. We ship Monday - Thursday.